Solitary Islands half day Dive Trips, Coffs Harbour NSW’s tropical Diving! Solitary Islands half day Dive Trips are our speciality! Join Jetty Dive aboard their World Class Dive Charter Boats! To see the best diving around the Solitary Islands Marine Park, you must venture offshore to the Solitary Islands themselves, located on the Mid North Coast of New South Wales. You will be amazed the variety of Marine life! A mixture of fish from the tropics and sub-tropical varieties as well. Out there the water is usually much cleaner and warmer because of the East Australian Current. The South Solitary Islands are 30 to 40 minutes travelling time on our fast boat, so comfort is important, and size counts! The North Solitary Islands are up to 75 minutes away from Coffs Harbour, so the speed we have available on our boats counts! Never Dived before or you want to Learn to Dive? Just click on this LEARN TO DIVE link! Why Jetty Dive’s Solitary Islands half day Dive Trips!? The Boats! … Big Boat Comfort without the crowds! “Wild Fin” is built for speed and comfort!Jetty Dive is the home to the most spacious, comfortable Dive Charter boat in Coffs Harbour. It is the only “Big” Dive Charter boat between Forster and Wooli. “Wild Fin” is of suitable size to provide the highest level of comfort and conveniences. Shelter from the Sun, Rain and Rough seas. You do not get cold or wet and it’s not too bumpy! A Toilet and easy access Ladders are features of our boat, that make a big difference to your comfort. Small group sizes are important, we have qualified staff to allow the groups we lead, to be small and not too crowded. “2 Wild” is built for speed and comfort! 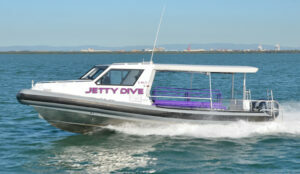 Jetty Dive is the home to the most spacious, comfortable Dive Charter boat in Coffs Harbour. “2 Wild” is 2 metres shorter than “Wild Fin”, but performs in the sea as good. With economical but powerful engines, “2 Wild” can run extended trip with ease. “2 Wild” is of suitable size to provide the highest level of comfort and conveniences. Shelter from the Sun, Rain and Rough seas. You do not get cold or wet and it’s not too bumpy! When do we run Snorkel and Solitary Islands half day Dive Trips? 7.00 to 7.30am returning at approx 12.30 pm. Between the dives we supply light refreshment (Soup, Tea, Coffee, Savoury & Sweet Biscuits, Seasonal Fruit, and Sweets). We dive in small groups, with a FREE Dive Leader service available. You will dive two fantastic locations at the Solitary Islands. Rebreather Divers are welcome! However our schedule of two dives is not altered, you may choose to do 2 x 1 hour dives or arrange to complete 1 long dive. A guide will not be able to join you unless they are on a Rebreather on the day. Cost is the same as a Double Dive. Certified divers can elect to dive without guides. Additional costs if you require a personal guide. How much does the Solitary Islands half day Dive Trips cost? Prices as from April 2016. Snorkel Trips. May be with divers in the morning or afternoon, depending on conditions and demand. Snorkel Trip …includes all equipment $85. Double Dive Trips. Two dives on a single morning trip with approx 1 hour surface interval. Night Dive trips, Single dive on a trip to Split Solitary Island. *North Solitary Island Trips are 50 – 75 minutes each way and are dependent on good weather and diver numbers (minimum of 8 divers) and usually by arrangement only. Gear and tank hire is extra. **Pimpernal Rock trips are by special arrangement and reliant on weather and currents. Minimum number of 10 divers. Gear and Tanks extra. Tanks and weights add $40 per diver, full gear hire add $100. Long Weekend Package (3 Days). Tanks and weights add $60 per diver, full gear hire add $150. Tanks and weights add $80 per diver, full gear hire add $200. The Solitary Islands half day Dive Trips rely on minimum numbers, and have maximum limits too, so prior bookings are essential! Be early in busy times! Dive Charter trips are weather dependent, and may be cancelled if unsuitable sea conditions prevail, Rain does not constitute for bad weather, in fact it can be better, and fish come closer! Don’t forget if you are vulnerable to Sea Sickness, you may want to take medication! Download a Dive Charter form and bring it in with you to save time before the charter. click here to Email US for any Booking or question! Adventure Snorkel trips to the Solitary Islands. Trips depart on a daily basis with scuba divers or 8.30am if a snorkel only trip, returning 11:30-12:00pm. You will visit two exciting snorkelling sites during your morning adventure. All snorkelling equipment rental (mask, fins, snorkel and wetsuit) is included. Depending on demand, we can offer private boats, or charters to suit your requirements – choose our ‘OWN BOAT’ option – Dive where you want, when you want. temperate fish life found only in this region. The sanctuary zones around the islands protect our corals and fish, for divers to experience the area in it’s natural state. Guided underwater tours are our speciality, taking you through the best sites. We have dived the area for years, and know the locations and their features. Grey Nurse sharks of “Manta Arch”, Blue Tangs of “Boulder Wall”, Lionfish of “Buchanan’s Wall” or the coral gardens and Nudibranch’s of Split Solitary. Click here and Email Us! PROUDLY the only PADI 5 STAR DIVE CENTRE on New South Wales north coast for over 19 Years!